Teething | Call Me Mummy!! Back to blogging – What we’ve been up to! Oh my goodness! Where has the year gone! In a few weeks it’ll be Christmas but before that, my beautiful daughter’s birthday! Can’t believe Aj will be FOUR next week!! Noooo! I’m not ready yet! It crazy how this year went by, having a baby really does that to you! So what has been going on in our lives? 8 Months old Check-up & Back to Work! My little man turned 8 months this week! What an amazing journey it’s been getting to this stage! I definitely have to say motherhood has been a lot easier better this second time around – breastfeeding for one was smoother, weaning is going better and I guess I’m just more relaxed as a mother. I pray I haven’t jinxed things now! Junior is still a serious little man, chilled out and not fussed at all, except at night or when he isn’t getting what he wants. We still have to work for the smiles but when they come it melts my heart every time! So what has 8 months brought about? Anjie turns 9 months today! Yippeeee. I’ve also been back at work now for just under two months, although I haven’t quite gone full time yet (that’s in October) it’s being… Interesting. I honestly can’t say it’s been fun because it hasn’t! But thankfully it gets better and easier everyday. I will be strong! 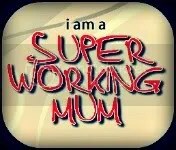 I will officially become a working mum!